The teams from Music Is Art and the Tonawanda, New York Guitar Center. Los Angeles, CA (October 29, 2015) – Guitar Center donated 12 collectable guitars autographed by Goo Goo Dolls, Kevin Bacon, Dierks Bentley, Blink 182, Tommy Chong, Billy Ray Cyrus, Ray Davies (The Kinks), Snoop Dogg, Willie Nelson, John Rich (Big & Rich), James Taylor and Rob Thomas (Matchbox 20), for the Music Is Art charity auction in Buffalo, NY, which raised over $31,000. All proceeds from the auction will benefit the Music Is Art organization, which is dedicated to exploring and reshaping music's cultural, social and educational impact on the community through a variety of programs and events. 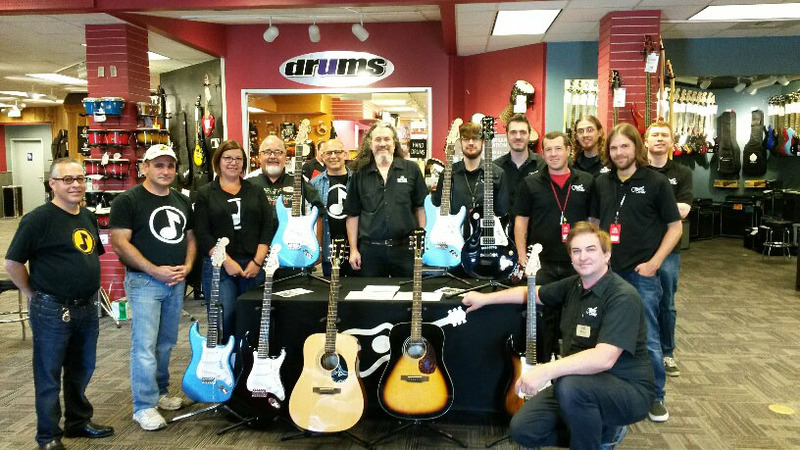 Photo caption: The teams from Music Is Art and the Tonawanda, New York Guitar Center. Music Is Art is a not-for-profit, federal 501c3 organization founded in 2003 by Goo Goo Dolls bassist and Buffalo resident, Robby Takac. The organization is dedicated to enriching the local community with access to music. Its mission is to encourage people to find their musical voice, think about how music touches their lives, and most importantly think about the fact that...music is art. Now in its 13th year, the Music is Art Festival is free all-day fundraiser event featuring an eclectic array of Buffalo's finest artists, musicians, DJs and entertainers. This year’s event will took place on September 12th in Delaware Park and featured a special live performance by The Goo Goo Dolls.